Moms and dads, grandmas and grandpas: We apologize in advance for this somewhat mind-blowing information. With Thanksgiving fast-approaching, hosts are under a lot of stress preparing for the holiday — which, of course, makes them ideal targets for pranks. That's where the #25lbTurkeyChallenge comes in. Adult(ish) children (i.e. millennials who may be hosting their first Thanksgiving dinners) have been duping parents by texting them the question: "How long does it take to microwave a 25-pound turkey?" Then they've been posting the answers, many of which are absolutely hilarious, to social media. "The key word here, being 'microwave.' Definitely not a good idea to microwave a turkey," TODAY's Carson Daly said, while explaining the prank. 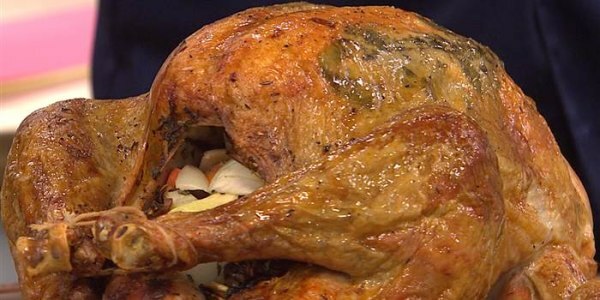 While the reactions are chuckle-worthy, some unexpected news about how to cook a Thanksgiving bird has surfaced since the joke went viral: Yes, millennials, you can microwave a turkey. And the advice has come from none other than the company behind the famous Turkey Talk Line: Butterball. This may come as a shock to the thousands of parents who just disowned their offspring for even asking such a question. One tweeter's dad replied that he's "no Guy Fieri," but nuking a turkey doesn't sound great. The mom, however, cut to the chase. Upon receiving the text, some parents thought their kids might be drunk ... or high. Caroline Bryan, the wife of country music star Luke Bryan, was duped by her niece. She said that a bird made in the microwave would likely taste like a "bicycle tire." Some parents, however, had legit answers. But according to the experts at Butterball, microwaving a turkey is totally feasible ... and surprisingly safe. A 25-pound turkey is likely going to be too big to fit inside any conventional microwave (but if you're Heather Dubrow, your microwave is probably large enough), however, a smaller bird that will adequately feed friends at Friendsgiving in that tiny first apartment or dorm can certainly be done. Thaw the turkey first. Never put a frozen turkey in the microwave! First, microwave it for 4 minutes per pound on full power (for example, 36 minutes for a 9-pound turkey) to get the cooking process started. After this initial cook time, the rest of the cooking needs to be on a lower power setting. Flip the turkey over and cook it at 50 percent power for 8 minutes per pound (72 minutes total). Stop cooking every 18 minutes to check the turkey's temperature with a meat thermometer and baste it with the natural juices or a browning sauce. When the turkey reaches a temperature of 180 to 185 degrees in the thigh and 170 to 175 degrees in the breast, it is ready and safe to eat. If any kids or young adults out there have already been shunned by their parents for asking the microwave question, help is just a phone call away at Butterball's official Turkey Talk Line: 1-800-BUTTERBALL. They handle over 100,000 questions every year, so there's a good chance the expert on the other end of the line will have a solution to any last-minute query.